Existing Members – Renew Now! FC Barcelona traveled to Madrid and snatched victory away from Atlético Madrid with a 1-1 draw. Atlético Madrid were on course to leapfrog the Blaugrana to claim the top spot in the league table when Diego Costa’s header gave the home team the lead in the 77th minute. With a victory, Diego Simeone would have claimed his first La Liga win over Barcelona. 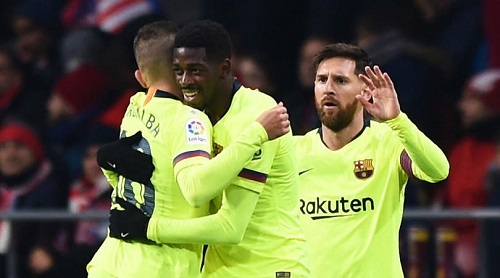 However, the Blaugrana battled back earned the visiting side the draw when substitute Dembélé scored in the 90th minute. This result means Barça were still league leaders but Sevilla can overpass them with a victory tomorrow. Next up for the Blaugrana is a trip to the Netherlands where they will play their fifth Champions League group stage match against PSV Eindhoven. Atlético de Madrid: Oblak, Arlas, Savic, L. Hernández, Filipe Luis, Koke, Rodrigo, Saúl, Lemar (Vitolo, 63′), Griezmann & Diego Costa (Correa, 79′). FC Barcelona: Ter Stegen, Semedo, Piqué, Umtiti, Alba, Sergi Roberto (Rafinha, 45′), Busquets, Arturo Vidal (Malcom 83′), Arthur (Dembélé 79′), Messi & Luis Suárez. Goals: 1-0, Diego Costa (M. 76); 1-1, Dembélé (M. 90). Cautions: Busquets (M. 28); L. Hernández (M. 38); Griezmann (M. 40); Diego Costa (M. 70); Umtiti (M. 70); Rodri (M. 85); Filipe Luis (M. 85); Rafinha (M. 90+2). Previous PostBetis defeat Barça 4-3 in a thriller at the Camp Nou. Next PostBarça defeat PSV 2-1 and win Champions League group. Would you keep Ernesto Valverde as Barcelona coach?